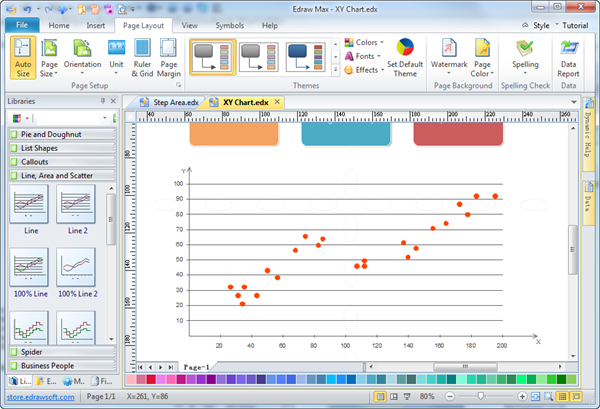 Edraw provides some interactive XY chart and scatter graph symbols that offers advanced features yet is simple to use. Scatter chart is commonly used to graph paired data such as scientific, statistical and engineering data. It has two value axes, showing one set of numerical data along the X-axis and another along the Y-axis. As the cursor moves, the X-axis and Y-axis value change real-time and automatically. Thus, users can gain higher precision in drawing. Easily edit the data by double clicking a point and typing. Automatically change the scatter location after altering the value. Easily change the chart location and size by moving the yellow diamond handle in the chart. Quickly add or remove a category by just clicking the floating button. Choose various marker styles by clicking the floating button for clearer distinction between different categories. Rapidly refer to help from manual within the software by pressing F1. It is easy to design XY Chart, scatter chart, step line graph, area chart and more. XY Chart shows the relationships among the numeric values in several data series, or plots two groups of numbers as one series of XY Coordinates. Scatter compares pairs of values. For example, the following scatter charts show uneven intervals of two sets of data.